So, I'm waiting for a bit more memory to test again. I hope I will discover the full potential of this Oracle VMware soon. My goal is to run Oracle 10gR2 in a VMware session. This allows me to do whatever I want on the OS and on the database. I will mainly use it as a testing/playing environment as I try a lot of new (beta) things, apply patches and do a lot of demos and POCs. 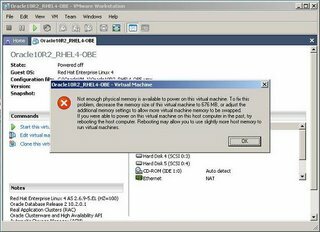 VMware allows me to reverse the image/snapshot as much as I like. You've the choice to install a VMware with as OS; Redhat or Novell. I chose for Redhat (RHEL4). You need to download three zip files from OTN and an additional download on the Redhat site. You also need to do some registration to get a trail key. The links to download are in this url: http://www.oracle.com/technology/tech/linux/vmware/index.html as also a detailed readme about the installation. It takes some time to download as it's a bit more than 4GB! Once downloaded you need to unzip all files in the same directory! I did a mistake here, by using different directories, which caused the installation to fail (didn't find the right files). You run the installer, and he does all the work. I used everywhere the default settings and it worked perfectly. 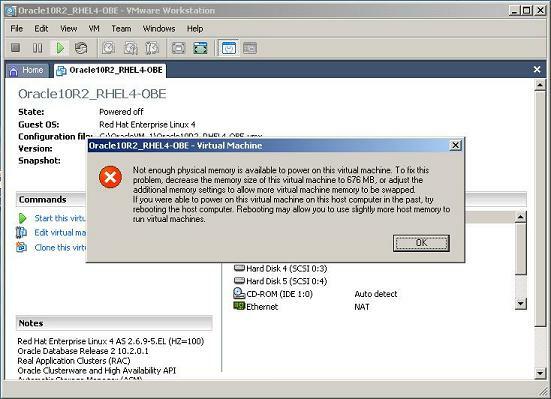 Oracle delivers a nice package in this VMware image. I got Oracle 10gR2, JDeveloper 10g, HTMLDB 1.6, OWB 10g, RAC, Migration Workbench and some others. It needs to be said that these versions are not the latests one. Today there're already some patches for the database and JDev, HTMLDB and the others have also a more recent version. But nevertheless it's nice to have all this, without doing any installation or configuration. I'm not satisfied with the first tests. I've certainly a lack of memory in my laptop (only 1GB), but there's also something strang happening with the consumption of memory of VMware (it sometimes swaps from 300MB to 50MB etc.). I found some performance improvements on the KB of vmware.com and at first sight it's getting better. I sort of like getting the requirements, crafting a prototype, refine the requirements, implement the solution. 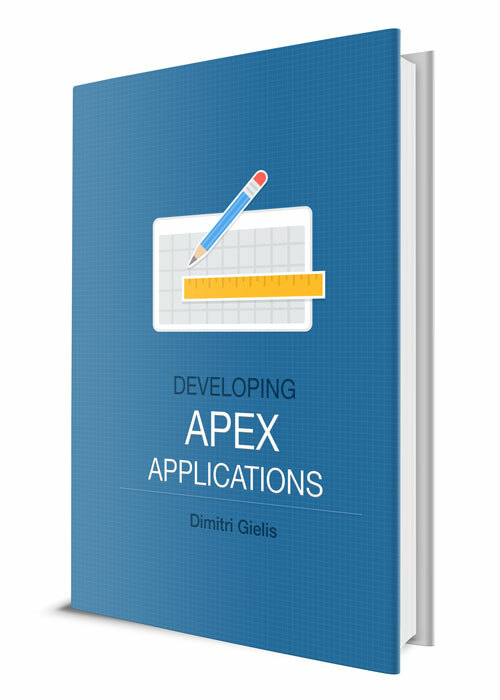 APEX is best suited for very small development teams (1 to some very small number). Not a big fan of XP or Agile - the old "throw it out there and see if it sticks" method. We are redoing asktom from the ground up now. two developers. step one - list the requirements. step two - prototype/discuss prototype. step three (which we are in now) refine. step 4 - implement (with the requisite test phase and all) "
Many thanks to Tom and Steven for their opinions! I really appreciate it. Today at the customer I had a really nice joke! At 12h55 my desktop pc restarted, just like that?! Ofcourse I was writing some scripts, some info was loading etc. At the time I saw the strang behaviour of Windows, I couldn't do anything anymore! My windows/docs closed like that, although for some windows for 2 seconds it asked if he should save the content. Before I could say 'Yes' it was already gone... I couldn't stop the shutdown progress anymore!! But hey! I was not alone ;-) my colleagues had the same phenomenon. "Please be advised that we suffered from a technical issue on multiple PCs, which may have caused the reboot of your machine. Our technical team is currently investigating the problem as a matter of urgency. We will inform you as soon as normal service is restored. I found in my archive some nice pics from the seminars I followed, organized by mine passed away friend Lex de Haan. "I don't follow any single methodology in a hard and fast way; I definitely lean to the lightweight meths., like XP and Agile. In my current main development projects, Qnxo and Qute (www.qnxo.com and www.unit-test.com), I rely heavily on table APIs and avoid writing SQL whenever possible (Qnxo generates the table APIs for me!)." The quest goes on... I will post more about this when I find more info and make my final decision. Somebody told me that not all links on the blog were working... this should be solved now. It had all to do with bad copy past. The last couple of weeks I'm looking to create a real Oracle Development Framework. Concerning the technical part, my decision is clear. As I really adore the Oracle database, I try to do as much as possible into the database. That's why my Oracle Development Framework will exists out of Oracle 10gR2 DB, PL/SQL and Apex (Application Express - before the name was HTMLDB). For the "functional" part / "methodology" I'm still investigating what would be the best. - I had some chats with others about frameworks, way of working etc. Apparently “Extreme Programming” is in! (http://www.extremeprogramming.org/) “XP” is a deliberate and disciplined approach to software development. - I read an article of Duncan Mills. He gave an excellent presentation on meta framework. He discussed the challenges we face when developing (web) applications and how meta frameworks can help us developers to tackle those problems. A recap of his presentation can be found here. The presentation of Duncan can be downloaded here. - But this is my favorite! “Cleaning Up PL/SQL Practices” (By Steven Feuerstein) I found on OTN. As I find Steven one of the PL/SQL guru's, I thought about follow his guidelines and use his soft (PL/Generator, Qnxo, Ounit; soft for PL/SQL framework, unit testing, best practices, checks, …) together with the approach of XP. - Next to that my other "leader" is Tom Kyte. I really appreciate his view, his approach of proving what he's saying, his knowledge and the way he promotes Oracle. Top 10 things I hate of a DB - Something serious!?! These top 10s are not from me!!! I was searching for some good Oracle books and thought it would be nice to share my list with you... Of course you have the normal reading stuff, like the Oracle concepts guide, installation manual and all the other docs you get with the database. Next to that you have the "white" Oracle education books to get an overview of a particular item. For ex. when I do a new OCP exam, I use these books to prepare myself. I'm somebody who doesn't like to say something, without really knowing, testing and proving what I "think" I know. In my opinion (I didn't yet read them all, but this is just a matter of time), the below books use the same approach; they say something and they prove what they're saying with real test cases, so I can test it myself and see if it's still/also valid for my database. I really like the Oracle database and I would like to do as much as possible in the database, that's why my list is limited to Oracle DB and PL/SQL books. This list of books is just what I think are good books for me and for my team, in the limited area of databases and PL/SQL, next to the Oracle manuals and OTN sources. I should put some xml/xmldb/java related books on my list, but for the moment I don't do a lot with these features and I'm satisfied with everything I find on OTN. If you know some other good books or want to share your thoughts, you may add your comments. Apparently you couldn't put any comments on the posts... this should be possible now. You're free to make comments! Changing WE8ISO8859P1 to UTF8 with ALTER DATABASE CHARACTERSET! Today I did something "tricky" with the Oracle database... I went from one characterset to another although it was not a superset/subset of eachother. The client requested to go from WE8ISO8859P1 to UTF8 characterset. You would normally create a new database with the new characterset and do an export/import, but I looked for an other solution. I found a note on Metalink (Note:260192.1) which described how you could do it. Basically I followed it, and the first tests after the change in characterset were good. I will provide a zip-file with all the scripts I used and the steps I followed. A Metalink note is good, but it always refers to other notes... In the zip-file you see how I did it, the most important file is change_charset.sql. The zip-file can be downloaded here.